Astarte Moon Inspirations a life closer to nature's rhythms : Brigid's Imbolc blessings positive inspirational quote. Follow the Brigid bliss. 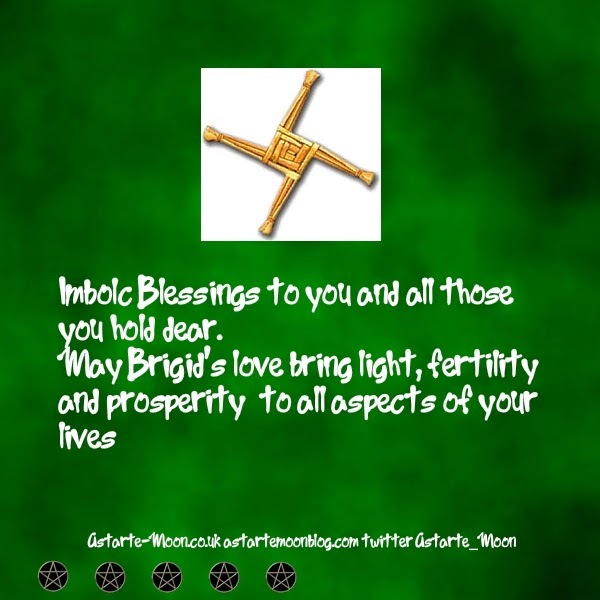 Brigid's Imbolc blessings positive inspirational quote. Follow the Brigid bliss. Imbolc blessings to you and all those you hold dear, wherever you are, all around the world. May the Goddess Brighde be in your hearts and her love bring all the goodness of the first awakenings of spring to you and those around you. Brighde, Brigit or Brigid was celebrated as the Goddess of Fertility, may she bring prosperity, fertility and happiness into all aspects of your lives. Brigid was said to be the mother of the God Yule, she is nursing him now at Imbolc as he grows strong. She is known as the fire goddess and many celebrations centre around fire building and the lighting of candles. Brigid is one of the few Pagan goddesses who still survives to this day, she was adopted by the Christian church and was worshipped as Saint Brigit, although she was de canonised in the 1960s, she is still venerated in Ireland. Embrace the spirit of Brigid and bring her love and joy into your lives. Our earth is awakening, allow yourselves to awaken and blossom, you will be amazed at the wonderful happiness that lies waiting ahead of you. Follow the Brigid Bliss.